. :: HEAVY METAL, ETIJAAH AND MUARRAB ROMPS ADRENALIZE PRE-CARNIVAL CARD ::. Meydan Racecourse staged, undoubtedly, their best races of the season on Thursday evening, with three Listed Thoroughbred races as well as the Madjani Stakes for Purebred Arabians. The Dubai Creek Mile Sponsored By Lincoln Continental was dominated from start-to-finish by Heavy Metal, who was never headed under Royston Ffrench, riding for trainer Salem bin Ghadayer and Sheikh Hamdan bin Mohammed Al Maktoum. Well-fancied Doug Watson trainee Cosmo Charlie faded to fourth after being unable to keep pace with his front-running and ultimately victorious foe. French said: “He is a tough horse and once we were able to get that lead, without working too hard, he was always going to be hard to peg back. Normally he needs a couple of runs to get going, so for him to win first time out this season has to be a positive. The second of the big races on the card was the 2000m The Entisar, sponsored by Al Tayer Motors, which was won emphatically by His Highness Sheikh Hamdan bin Rashid Al Maktoum’s Watson-trained Etijaah. Settled in third throughout the early stages, jockey Dane O’Neill was able to pull out and set sail for home turning into the straight, ultimately dominating his foes, including Godolphin Mile (G2) and stablemate Second Summer. Fellow Watson trainees Faulkner – making his second start after a 20-month layoff – and Storm Belt finished third and fifth, respectively. Second Summer missed the break, made a mid-race move and flattened in the final 400m. “The 2000m is probably his ideal trip and he seems to relish the kickback when in behind so everything was ideal tonight,” O’Neill said. “Second Summer walked out of the gate, but he made a little run in the middle of the race,” Watson added. “He’s been off since March and probably need the run, anyway, but he didn’t need a start like that. It’s hard when you have three or four horses and one real fancy horse you’re expecting a lot out of for the season. “I love seeing Etijaah win and it’s great for Sheikh Hamdan,” Watson continued. “Dane rode a great race. He stayed in there and took the kickback. Storm Belt and Faulkner ran well. Faulkner is going to get better with racing as long as keeps coming out of them alright. He’s such a heavy horse. He’s tough to get fit. We’ll try to keep him sound and if we do, he’ll win a race in the Carnival. 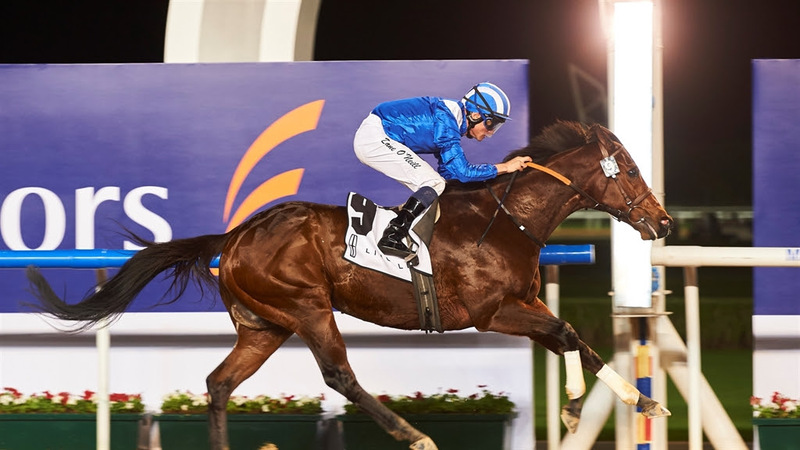 The Garhoud Sprint Sponsored By Lincoln Navigator was then also won by O’Neill for Sheikh Hamdan, this time with the ageless Ali Rashid Al Rayhi-trained Muarrab, a previous winner of the Group 1 Golden Shaheen, which he landed in 2016. The meeting opened with the only Purebred Arabian race on the card, The Madjani Stakes Sponsored By Lincoln over 1900m. It was won, in style, by Mawahib, who won her third race in a row at as many racecourses. Riding for HH Sheikh Khalifa bin Zayed Al Nahyan and Al Asayl trainer Eric Lemartinel, Tadhg O’Shea always looked confident in midfield on the filly before making smooth progress to lead early in the straight. The Lincoln MKC Trophy, a 1400m maiden, appeared to be contested at a ferocious early gallop but One Season, always at the head of affairs, maintained his early exertions to record a taking victory over a game race-long pursuant in Hucklebuck. The Lincoln MKX Trophy, a 2000m maiden, was won in decent style by Mr. Ali A. Aneizi’s Street of Dreams, always prominent under Pat Dobbs for Doug Watson. Having just his fourth career start, it was a deserved win after one good outing in the UK and two previous placed efforts in the UAE. The Lincoln MKZ Trophy, a 1600m handicap finale on the card, was won with an impressive late kick by Al Alawi Racing Syndicate’s Helal Al Alawi-trained Sea Skimmer. A lightly raced son of super-sire Dubawi, he closed well to pip Flashy Snapper and win his second race from four career starts.